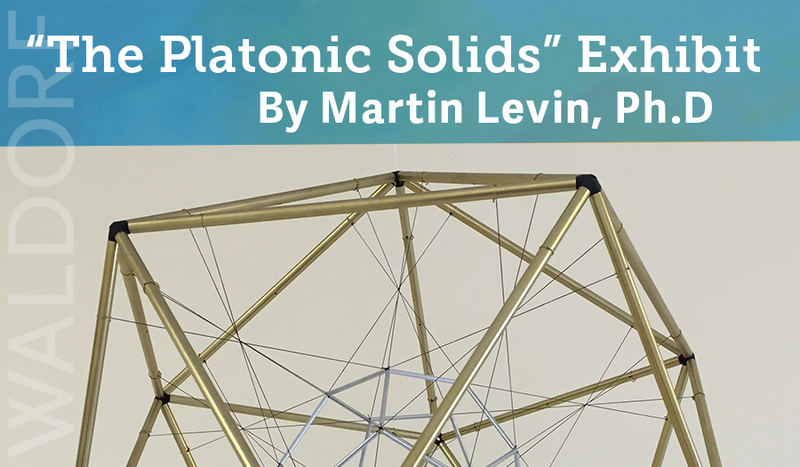 "The Platonic Solids" An Exhibit of Geometric Sculptures by Martin Levin, Ph.D. is now on display in the Community Gallery at the Waldorf School of Baltimore from January 11 - March 10, 2016. Meet the artist on Tuesday, March 1 from 3:30 - 5:30pm at The Platonic Solids Reception with a musical presentation by the 4th and 5th grade. In the Waldorf curriculum, students do a lot of careful geometric drawing as well as construction of three-dimensional geometric forms. This develops the ability to visualize and think more clearly. In particular, the program includes a study of the Platonic solids in grade 8 and projective geometry in the high school. The five Platonic solids, which were already studied in Ancient Greece, reveal fundamental properties of space. The twenty-four pieces in this exhibit explore some of the many remarkable relationships between the various Platonic solids, drawing on ideas from projective geometry and elsewhere. The sculptures will stimulate inner activity, by calling upon the viewer to inwardly form images and visualize forms in movement, to see in the mind what is suggested by, but is not physically present in, the pieces. Martin Levin received his Ph.D. in mathematics from Johns Hopkins University. He spent much of his career teaching mathematics in Waldorf high schools. Since retiring, he has exhibited in numerous conferences and art galleries. For more information Edna Emmet Art & Woodwork Teacher at eemmet@twsb.org or 410-367-6808 x 381.